About to re-brand and re-launch as Sapphire Coast Buslines, the soon-to-be-former Deane’s Buslines South Coast operation, owned and operated by Jamie and Anton Klemm, has just acquired Tathra Bus Service. Jamie Klemm (pictured) is a descendant of noted bus operators the Deane family who sold their Queanbeyan operation in 2012. Jamie says she is excited with the opportunity to expand on the southern NSW Sapphire Coast by incorporating Tathra into the business. The expansion to incorporate Tathra brings the Klemm’s bus and coach fleet to 34, retaining Tathra’s driving and cleaning staff and utilising a depot at Bega to complement Sapphire’s depot at South Pambula on the southern NSW coast. While the sale means expansion for the Klemms, it also means departure from the industry for veteran bus operators John and Janny Daly who had owned Tathra Bus Service for 31 years. "We would like to wish John and Janny all the best in their future and are proud to be taking on the business they have worked so hard to establish," says Jamie. "We are also pleased to retain all their driving and cleaning staff and to continue utilising the Bega depot." Jamie says the sale precedes the official launch of the new name for the South Pambula-based bus service, to be known as Sapphire Coast Buslines from February 8. 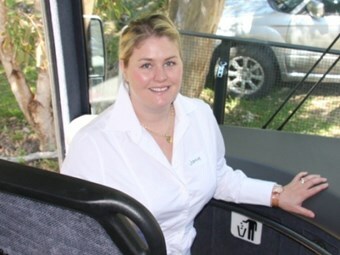 Jamie says the name change reflects her company’s commitment to the Sapphire Coast, which started with the Klemms purchase of the Pambula-based bus company in 2005. "Our business will remain family-owned in this region for a long time to come," Jamie says. "We are continually looking at ways to expand, grow and offer more services to the local community, and since 2005 we’ve established two other affiliated businesses to complement our bus company." In 2008, the Klemms started SoulQuest Travel, a luxury coach charter tour company and travel agency. In July 2012, the young entrepreneurs added car detailing business SparQle to their business portfolio. This year Sapphire Coast Buslines will transport more than 2400 school students to 14 schools in Eden, Bega, Wolumla, Pambula, Pambula Beach, Merimbula and Tathra. The business also runs an extensive route and demand-responsive timetabled service for the broader community which includes 38 timetabled mid-week routes and six on Saturdays.